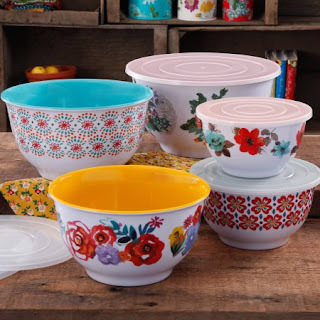 I just LOVE these The Pioneer Woman Country Garden Nesting Mixing Bowl Set, 10-Piece for $24.50 (Retail $49). The Pioneer Woman Country Garden Nesting Mixing Bowl Set, 10-piece, features classic designs that are timeless. They are made of plastic and embellished with a variety of floral and leaf patterns for an eye-catching flair. Use them for everyday food preparation, from mixing ingredients for baked goods to tossing salads. They are also ideal for serving bowls of chips and popcorn at casual parties and get-togethers. This melamine mixing bowl set includes five bowls and five lids. These pieces are not safe to put in the microwave, and they must be washed by hand only. Pair them with other items in the Pioneer Woman collection, such as dinner plates, salad plates, mugs, footed goblets, ceramic bakeware sets, serving bowls and platters and more (each sold separately).